The mobile app is useful for crowd sourcing tests with OONI Run feature during events such as elections and protests. The previous version of OONI Probe did not have any mechanism for user to easily share test data, other than a screenshot and it takes days before the data is made available publicly. This made it difficult for researchers and experts to verify results accurately in a timely manner. 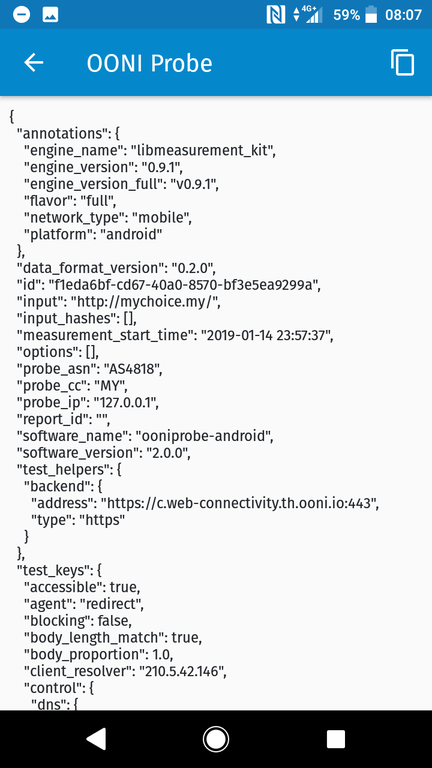 The new mobile version of OONI Probe now makes it easier to browse results, providing ASN ISP info and also an easy way to copy and paste raw test data, which can then be immediately shared with researchers for verification via instant messaging or email. In Southeast Asia, Thai Netizen and partners should able to make use of these features for the upcoming Thai general elections on 24th February 2019. For any other unexpected event, we can now quickly get and analyse test data from the public, and make better accurate announcements on censorship or workarounds backed by technical test data. DNS redirection or hijacking is a now common and effective method in implementing censorship of websites, in Southeast Asia as more sites are secured behind encrypted http connections, and protected against DDOS attacks through CloudFlare and Project Shield. As a workaround, many sites which are the target of censorship such as independent media, elections monitoring, transparency and rights groups often prepare alternative backup domains, which are only announced to the public when the main domain is blocked. 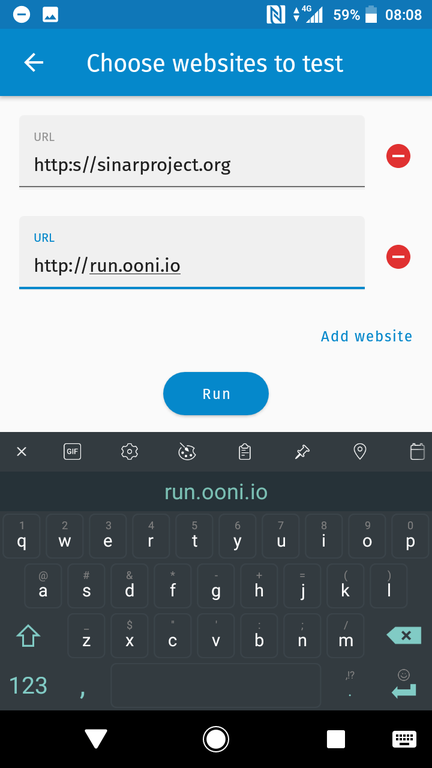 The ability for the mobile app user to enter and test new URLs without the need for an updated OONI Run link, along with the previously mentioned results sharing feature, again allows researchers and monitoring groups, to be able to react quickly and verify new sites which might be the target of online censorship. The public can also test and verify independently on their own, URLs that are not being monitored by others. 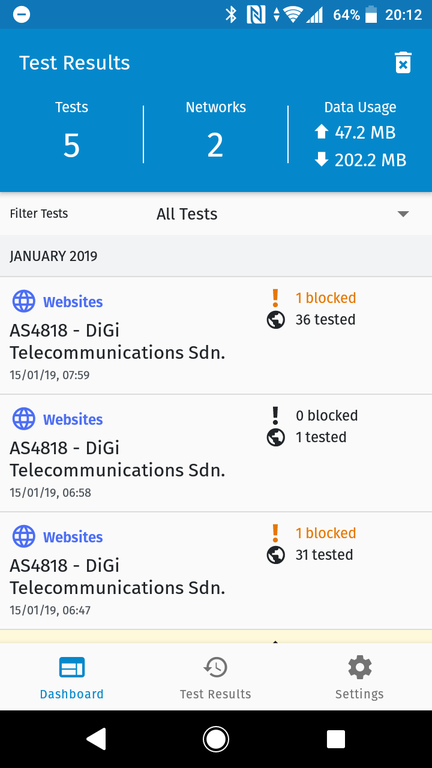 Testing on mobile networks requires data, and the option of specific categories that also test local country lists, help make it less costly for the general public to run tests for categories that are of interest to them, or to avoid testing sites that they might be uncomfortable or dangerous such as terrorist websites. We also hope this feature will encourage more people to help contribute towards improving and keeping up to date test lists, which in conjunction with test data from OONI Probe provide researchers and developers with valuable meta-data to build dashboards and generate reports.